DMi Antigua Wood Computer Armoire in Cherry by DMI Furniture at Momiji Studios. MPN: 7480-75. Hurry! Limited time offer. Offer valid only while supplies last. Inspired by island living, Antigua brings enchanting details to office environments with an expanded line-up to furnish any office requirement. Inspired by island living, Antigua brings enchanting details to office environments with an expanded line-up to furnish any office requirement. 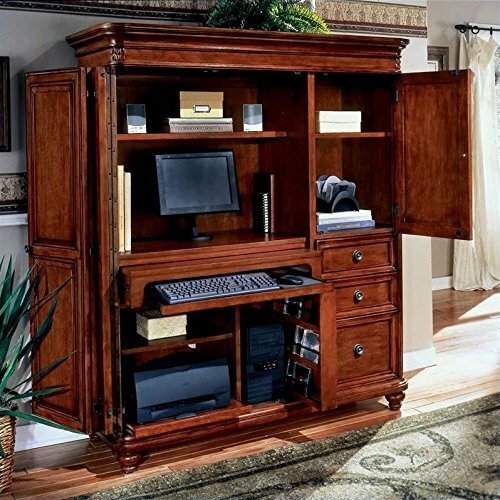 Features: Constructed from selected hardwoods and cherry veneers; West Indies Cherry finish; Tops are constructed of Marquetry cherry veneers with wood substraight and non catalyzed lacquer; Deluxe two tier pull out keyboard / mouse tray; CPU compartment with pull out CD rack; Storage cabinet with an adjustable shelf; 2 box drawers and one file drawer; Drawers are suspended on fully extending metal ball bearing slides; File drawers accept letter or legal size hanging files; Adjustable levelers to compensate for uneven floors. Specifications: Overall dimensions: 62" H x 55" W x 23" D; Monitor area dimensions: 15.5" H x 32.5" W x 18" D (25" H without shelf); Printer / scanner area dimensions: 9.25" H x 19" W x 18" D (17.5" H without shelf); Weight: 345 lb.